Dr. Myra Lew is a Los Angeles native, has spent most of her adult life in the Bay Area. She earned a Bachelor of Arts degree in Integrative Biology with an emphasis in Human Biology from the University of California, Berkeley in 1997. 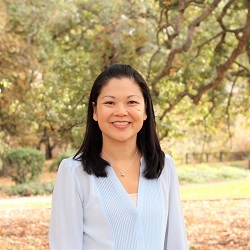 After graduation, Dr. Lew spent a year researching the affects of antibiotics on infected corneal tissue at Dr. Suzanne Fleizig’s Laboratory at the UC Berkeley School of Optometry. Dr. Lew then pursued a Doctorate of Optometry degree at UC Berkeley and also obtained a Bachelor of Science degree in Vision Science. She has trained at the Oakland Veterans Hospital, Sacramento Kaiser Permanente, and American Eye Institute at Cedar-Sinai Hospital in Los Angeles. For the past several years, Dr. Lew has managed a corporate Optometry office. In addition, she also served as an interviewer for Optometrists and led their orientations. Dr. Lew has also donated her time examining low income patients and an underprivileged population in the Dominican Republic. On the rare occasion of free time, Dr. Lew enjoys trying new recipes, traveling, and going on walks with her son. Dr. Lew truly enjoys helping her patients improve their vision as well as educating them about their eyes. She is known for her caring nature and sincerity.